What distinguishes MBH from the Ramayana is its riddling nature. Repeatedly it poses questions that are never fully resolved. Instead, they lead to new problems, right till the very end which poses the puzzle: whose is heaven and whose is hell? Most of the poseurs concern predestination vis-à-vis human effort, daiva vs. purushkara. Why is Draupadi, the heroine, referred to so often as Panchali, a puppet (of divine design)? Does following dharma lead to happiness? If not, why should it be followed? Who, or what, causes the devastation of the Kurukshetra war, which makes Sheldon Pollock call its story, “the most harrowing in world literature”? How is it a righteous war, dharma-yuddha, at all? 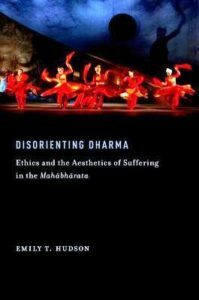 No wonder Shulman describes it as “a coherence of doubt and ambiguous riddles.” Hudson asserts that there is an ongoing dialectic between Dharma and Duhkha (suffering), but in claiming that Vyasa brings the audience time and again “to the brink of meaninglessness and then, instead of receding from it, it toys with pushing them over the precipice,” she exaggerates. Hudson finds that MBH stresses the necessity for passing beyond one’s individual agony to accepting the fact that suffering is a universal phenomenon. An example of this is the repetition of the account of sixteen great rulers of the past who, despite all their magnificence, died. In this, MBH is by no means alone. The same world-view is echoed in the Old English poems, “The Wanderer” and “Deor’s Lament,” with the recurring refrain, “That passed away; so will this.” Suffering stupefies the mind, which then takes wrong decisions, leading to further sorrow. The persuasion is in favour of distancing oneself from personal angst and moving on, if not to serenity, at least to stoicism. However, does this work for, say, the slaughter of Abhimanyu or of Dhritarashtra’s 100 sons? Nowhere, as Hudson asserts, does Sauti declare that having listened to MBH, one will not despair even in the worst circumstances. Actually, he celebrates the salvific nature of the work: one having faith and pursuing dharma will be freed of defects on reading MBH. The social force behind this obsessive concern with the problem of dharma is the challenge posed to Vedic sacrifices as winning Swarga and bringing welfare in society by the renunciant doctrines emerging around the 5th century BCE (the Ajivikas, Buddhists and Jains). At the core of these were ahimsa and abandoning samsara to attain liberation. Even in these new doctrines there was a conflict between the Buddhist and Jain belief that suffering was the consequence of human acts (karma) and that of the Ajivikas who attributed it to fate (daiva). MBH engages with both issues, but provides no resolution. The central figure in this investigation into the conflict between dharma and duhkha, proposes Hudson, is Dhritarashtra, whose lament occupies the first chapter, beginning with Draupadi’s marriage and ending with Ashvatthama’s killing Parikshit in the womb. Arguing that MBH deals with the aesthetics of suffering, Hudson necessarily deals at length with Anandavardhana’s assertion in Dhvanyaloka that the text’s predominant rasa is shanta, serenity. Underlying it is the emotion of vairagya, detachment from things of the world. He specifically cites the sad end of the Yadavas and the Pandavas. From the gambling match onwards, there is only suffering and more suffering for the Pandavas. Is Vyasa exposing the futility of human endeavour? It is this goal of attaining serenity by cultivating detachment that lends unity to the massive corpus of the text. Hudson argues that it is not the transience of material objects that is highlighted but, rather, the egotism that renders us vulnerable to grief over losses that are the inevitable result of kala, time. Hudson quotes Irish Murdoch who, in The Sovereignty of Good, ascribes our blindness to the truth of the human condition to “the fat relentless ego,” which daydreams and fantasises. For appreciating this shanta rasa, said the commentator Abhinavagupta, a sensitive audience (sahridaya) is essential that will focus not only on what the text is saying, but how it is being said. Thus, a dynamic ebb-and-flow is created between form and content. The expectations of the audience are aroused about certain characters, only to be brought up short later. This makes the audience stand back and think about the feelings that the text had aroused in them for “meta-reflection.” The model audience follows the text’s dhvani (suggestions) to fill in the gaps that it leaves, for it cannot say everything about the world. Hudson focuses on two types of situations: where characters face dilemmas and make a bad decision owing to mental confusion; and the resultant calamity because of which they are earither incapacitated by grief from taking positive action, or take further bad decisions leading to more suffering. Dhritarashtra is the prime example of how one knows the right thing to do but repeatedly does not do it. Crises are what typify the MBH scenario, which strips away the mental constructs that prevent us from realising the truth of universal suffering. It does this by providing not positive role models, but noble characters who take bad decisions and suffer terribly. Here failures are the route to learn how to live. For instance, after Duryodhana’s humiliation in Maya’s hall, the description of his intense agony shows the Pandavas in the negative role, arousing sympathy for him as the victim. This also enables us to understand his future conduct, based upon mental confusion caused by envy of the Pandava wealth. That, in turn, leads to the wrong decision regarding the gambling match: victory at any cost becomes an obsession. Dhritarashtra’s speech at the end of the dice game focuses on the mind as the root of misfortune, for it makes the right act appear fruitless and the wrong one fruitful. Suffering breeds confusion worse confounded. Yudhishthira’s behaviour in this episode distances us from the dharma-raja. He cannot be our moral beacon through the confusion. Moreover, both Dhritarashtra and Yudhishthira state that the world is controlled by fate, which is why one sanctioned the gambling and the other accepted the summons to it. As an instance of extreme suffering, Hudson takes up Draupadi’s predicament in the gambling match, which Nancy Falk has described as, “a sequence of the most intense insults to be found anywhere in the literature of the world.” The presuppositions underlying concepts such as “queen,” “wife,” “husband” and “daughter-in-law” no longer make sense as all the boundaries categorising them are smashed. The situation is exacerbated by the silence of the elders—learned Brahmins as well as eminent Kshatriyas—when Draupadi poses a question. This distances the audience from them as authorities on dharma. Is it the very subtlety of dharma that stands in the way? Does the silence of the elders indicate a state of serenity born of detachment, as Hudson’s thesis would propose? Or, is it the cowardice of courtiers, silent because the king does not censure Duryodhana? This silence is what creates dhvani, suggestion, in the perception of the sensitive audience. What protects a person from sudden oppression and how does one behave in such a world? If dharma does not, then why should one pursue it? Is that why Vyasa closes MBH with a despairing cry, “Why is dharma not practised?” Or, following Hudson’s suggestion, is dharma to be followed “for the sake of nothing,” analogous to the concept of doing karma for its own sake? Hudson provides a fine analysis of blind Dhritarashtra’s paradoxical “eyesight of insight.” Indeed, as J.P. Sinha has said, Sanskrit literature does not depict the suffering of any other character at such length. Gandhari’s intense anguish is concentrated in the Stri Parva, but her husband’s extends all through the text. Further, the blind monarch is at once the agent and the victim of suffering. It is he who receives the most advice on how to overcome grief. How he responds, again, shapes the audience’s learning. Dhritarashtra states that the bewildered Duryodhana bewildered him, because of which he took wrong decisions. All along, he sees clearly what should be done, but never does. By making most of the advice about right action come to him from Vidura, who is dharma-incarnate, is Vyasa showing the futility of the dharmic way? Hudson does not comment if it climaxes in the manner of Vidura’s death, roaming naked in the forest, insane, starving to death? Or is that a slanted hit at the Jaina path? On the other hand, Sanjaya, urges the blind king to remain calm and not despair while listening to his war-reports because one is not the agent of one’s good or evil acts, but is manipulated like a puppet by divinity, or by past karma. Here, Hudson replaces Sanjaya’s “according to others, man is free to choose his destiny,” by “some are assigned by chance,” which is tendentious, to say the least, and calls in question her assertion that Sanjaya is suggesting that human effort is “severely if not completely limited.” Sanjaya is merely putting forward the different opinions prevalent regarding human agency, one of which asserts free-will. In his reporting, Sanjaya’s responses to Dhritarashtra have a single aim, viz. to direct him away from wallowing in despair towards fortitude. Hudson commits another error on page 129 in stating that Bhishma’s fall is the source of Dhritarashtra’s grief in the Shalyaparva, whereas it is the death of Duryodhana that is the cause. By using the narrative technique of flashback—each of Sanjaya’s war-books begins with the death of the general and then goes back to relate how it happened—all events are projected as leading inevitably to the hero’s death. The present, therefore, is rooted in the past as its future. This realisation is reinforced by the technique of switching between the result (war) and the cause (Dhritarashtra’s agency) repeatedly. Three arguments are advanced against grieving. Sanjaya’s point is that as the king was the agent of the wrong decisions, he ought not to wallow in negative grief, but act. This fails to convince Dhritarashtra about his responsibility for the calamity. Then Vidura presents time’s destructive nature and the cycle of rebirth hinging on sensory desire. The way out is to control the mind and the self. That leads to Dhritarashtra fainting, unable to face the nature of existence. The audience can recognise themselves in these reactions to suffering. Now Vyasa steps in and tells him that since the devas had engineered this war in order to relieve the earth of its burden he should abandon despair and reconcile with the Pandavas. This is accepted by the blind monarch. Gandhari presents the contrast because her lament is not just for her sons, but also for all those who have been slain. That, Hudson suggests, is the proper response to calamity. Sorrow is a universal phenomenon, not an isolated, individual experience. Tasting the “bitter tastelessness of shadow fruit,” (T.S. Eliot). Hudson proposes that it is because of this that in the last book the text evinces no shock or grief at the sudden deaths of Draupadi and four Pandavas. Where does dharma feature in this? Divinity (Krishna) appears to collaborate with time to restore dharma (the greater good), to relieve earth of its burden, to usher in the next yuga and, finally, being powerless to stop the war because of the intransigence of Duryodhana. Similarly, despite Balarama and Krishna’s joint efforts, they cannot prevent and actually participate in the fratricidal massacre of their clan. Strangely enough, Hudson does not discuss this. The question remains: how much suffering is acceptable for the triumph of dharma? MBH provides no answer. Hudson presents an excellent analysis of the final book showing how Yudhishthira’s experiences in “heaven” shatter all pre-conceptions about why dharma is practised, as he finds his virtuous wife and brothers in hell and the wicked Duryodhana in heaven! Then, the distinction between the two is revealed to be a trick. So, are we confident that, at the end, Yudhishthira is really in Swarga? We are distanced from the narrative as it ends, just as we were at the beginning when Yudhishthira, unmoved by the deaths of his wife and brothers, continued climbing up the mountain with a dog for company. When Yudhishthira says, “This is not Swarga,” and Karna in despair exclaims, “dharma never protects,” they are referring to a paradigm in which dharma is practised for the sake of a positive result in this life and the next. Manusmriti (8.15) enshrines this succinctly: dharma eva hato hanti dharmo rakshati rakshitah (Indeed, dharma destroyed, destroys; dharma protected, protects). It is this concept that is questioned. According to Hudson, the text is suggesting that such a presumption prevents us from realising the reality that suffering is universal. From the violation of Draupadi onwards, everyone strives to find a world where dharma is meaningful despite the presence of unjustified suffering. Even divinity, in the form of Krishna, cannot stem the tide of suffering that swells to engulf his own clan and finally himself as an agent. Perhaps, Krishna is not a victim, being absorbed in yoga in his last moments? The aesthetics of suffering reveals not what dharma is but what it is not. After all, the two key virtues that it extols, ahimsa (non-injury) and anrishamsya (non-cruelty) are both negative! Conventional ideas about dharma have to be cast aside for “a wider experience of dharma,” which “entails active participation in the presence of radical unmerited suffering.” One has to practise dharma not for any personal benefit, but for its own sake by cultivating detachment leading to serenity and liberation from the world of suffering. However, Hudson does not succeed in explaining why one should practise dharma for its own sake. If it leads to liberation from samsara, where is the validation for it in the MBH? On the other hand, does the MBH not present an existentialist view of the world where seeking a rationale for suffering is meaningless and the salvific paradigm of dharma absurd? James Hegarty: Religion, Narrative and Public Imagination in South Asia—Past and Present in the Sanskrit Mahabharata. Routledge Hindu Studies Series, Oxford, 2012, 234 pages. Here is a fascinating exploration of how the Mahabharata (MBH), the story-to-end-all-stories, re-constructed the significant past for the listeners and readers of its present and for its world which, James Hegarty of Cardiff University proposes, was South Asia. He explores what the MBH tried to do, how and with what success. He argues that it had a specific socio-religious and exegetical agenda, categorically placing itself above the Vedas and Upanishads as the sine qua non of learning. It constructs stories from Vedic rites (e.g. the churning of the ocean from soma pressing). In doing so it transforms ritual into itihasa (the Brihaddevata, composed by the epic’s immediate interlocutor Shaunaka, has similar features) and executes a narrative coup d’état. Just as Brahma’s Smriti, says the MBH, was abridged successively by Shiva, Indra, Brihaspati, Kavi and the seven rishis, so was the MBH from six million to successively briefer editions, the final being of one hundred thousand slokas. It also plucks Vedic figures like Indra, Atri, Surabhi, out of their context to expound new philosophical doctrines. In battle-descriptions it invariably likens the combatants to past heroes, creating an elaborate network of connections. An obvious example of using the past to make sense of the present is the Book of the Forest, where moping Yudhishthira hears the tales of Rama and Nala. His coming to terms with his existential predicament is portrayed at the end of this book where—over the corpses of his brothers—he solves the riddles posed by Dharma-Yama disguised as a crane. It is this relevance for practical living draws the audience and readers to the MBH. Another attraction is the repetitive debunking it indulges in. Thus, having extolled the emperor-making rajasuya sacrifice sky-high, it demolishes its empowering effect by the catastrophic dice-game that follows. Again, the potency of the much-vaunted ashvamedha is wholly undermined by the scoffing of a mongoose with a half-golden pelt (yet again Dharma). Even the merit of the much celebrated dharma-yuddha, righteous war, is questioned. The mongoose extols the poverty-stricken life of a Brahmin living by gleaning as the ideal and quotes Dharma on kings achieving salvation by selfless giving, while those holding showy sacrifices fall. However, for this Hegarty need not have gone to the 14th book. The very first book prefaces Janamejaya’s holocaust of snakes with a harmless lizard telling the vengeful Ruru that ahimsa is the supreme dharma. The mongoose-Dharma being freed from his curse by denigrating the sacrifice does not imply restoration of the value of the ashvamedha, as Hegarty asserts. For, this book concludes with Vaishampayana telling Janamejaya that equal to sacrificial ritual are gleaning, ahimsa, contentment, good conduct, sincerity, self-restraint, truthfulness and charity. He further states that gleaning and charity are salvific for all four classes (even the Shudra who was prohibited the Vedas). The MBH was meant for all four classes as well as women to whom the Vedas were not available. Let us not overlook the significant fact that Yama-Dharma had to take birth as a Shudra maidservant’s son Vidura because of another curse, and that he is Vyasa’s mouthpiece of morality, never subject to the dilemmas plaguing Dharma’s son Yudhishthira, but whose advice is like straws in the wind (except for his alter-ego Yudhishthira). The importance of the mongoose story in social and religious contexts is seen in its recurrence in Kshemendra’s epitome of the MBH, Bharatamanjari (11th century) and Vyasa’s disciple Jaimini’s Ashvamedhaparva (c. 12th century). Repeatedly, in the two massive tomes of Bhishma’s counsel, Vedic sacrifices of the past are critiqued. Even austerities and sannyasis are denigrated, while chaste domesticity, taking care of parents, honesty and non-attachment are held up as the paths to moksha. The MBH’s very setting is Shaunaka’s 12-year-long sacrifice against the background of Janamejaya’s snake-holocaust. Then, Yama’s 12-year-long sacrifice is the setting for the mortal birth of five Indras and Shri. Narada warns Yudhishthira that the rajasuya sacrifice heralds destructive war. In the Ramayana, Bharata prevents Rama from performing it because of this. At the end of the Udyoga Parva, Karna pictures the impending war in terms of a bloody sacrificial ritual. Then there is the over-arching image of Rudra presiding over it all, right from causing the descent of the five Indras and Shri to empowering Ashvatthama for the holocaust-at-night. 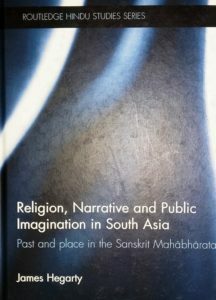 Hegarty argues that studying narrative against the background of early South Asian public imagination provides insight into the intellectual and social conditions underlying it. Modifying Marx’s description of the 18th Brumaire of Louis Bonaparte, he proposes that here every matter of concern is “transformed into narrative and debated as narrative” about both modes of governance and ways of moral living and reflect the processes of change in South Asia in late BC and early AD periods. The MBH was a deliberate intervention relating to issues of cultural power linked to current and past doctrines of belief and to processes of state formation against the Ashokan background of dharma-propagation (272-185 BC) and the Sunga campaign against it. Patanjali (of Pushyamitra Sunga’s time 185 BC? ), has several references to the MBH, as does his predecessor Panini (possibly early Mauryan). Prior to the 7th century BC (the Upanishads) and Buddhists and Jains (c. 500 BC) there is no mention of ahimsa or retiring to forest-life. In extolling these, the MBH is deliberately anachronistic, validating current ideologies by inserting them into the past, “Vedicizing” them. Other early texts and inscriptions testify to its success in this attempt. While legitimizing Brahmins, it also integrates new practices as “traditional.” For instance, instead of sacrifices, performing puja with lamps and incense, visiting tirthas, and, supremely, studying the MBH! Hegarty makes a dubious suggestion that the tale of the Chedi king Vasu falling into a hole for having recommended animal sacrifice reveals a “regionalist agenda of denigrating the Cedis.” After all, it is with this Chedi king that Vaishampayana begins his narrative, who is favoured by Indra with a sky-roaming chariot, an unfading garland and a bamboo pole to protect the good. Further, the Queen Mother of the Kauravas, Satyavati, is said to be his daughter. The book contains nuggets of information such as Sanskrit first appearing in inscriptions, replacing Prakrit, at the time of the Kanvas (c.73 BC); and the earliest MBH manuscript in Brahmi script being found in Kizil (Xinjiang, c.230 AD) listing the books Adi, Aranyaka, Udyoga (partly), Bhishma, Shanti, Ashvamedhika and the supplement (Harivansha), proving its circulation in Central Asia that early. The next evidence is from Kashmir in Kshemendra’s epitome in Sanskrit verse, Bharatamanjari c.11th century AD. Both lack the Anushasana Parva but include the Shanti Parva, showing that right from the 3rd century AD the epic was disseminated with considerable doctrinal material. This is evidence of deliberate composition, not compilation of disparate bardic narratives. The extensive spread of the MBH is seen in 6th century AD Cambodian inscriptions, the sculptures of Baphuon (11th century) and Angkor Wat (12th century). Eight parvas are found in Old Javanese (c. 10th century) and currently in shadow wayang puppetry. Stories from both epics and tales of Vikramaditya, Bhoja and Krishna are part of Mongolian folklore. A late 17th century Mongolian commentary, revising a Tibetan original, contains a summary of the MBH. The Japanese Kabuki play Narukami is the Rishyashringa tale. A 14th century Tibetan genealogy traces royal descent from Rupati a brother of Pandu who, after the war, went to Tibet where the people made him king. No evidence is cited, however, from Sri Lanka and Myanmar possibly because of the very strong Theravada influence. Thailand is heavily influenced by the Ramayana, not the MBH. Therefore, it seems South-East Asia, and Central Asia (Mongolia) instead of South Asia, which Hegarty proposes, was the world of the MBH. Through his treatise on Sanskrit grammar, states Hegarty, Patanjali sought to codify the language and thereby restore social traditions. The same ideological agenda underlies the Manava Dharmashastra, Arthashastra, Ramayana and MBH, of which the last highlights the turbulent clashes of forces in contemporary times, i.e. the centuries following Ashoka’s passing (pace Witzel and Hiltebeitel). Bronkhorst has suggested the existence of a strong non-Brahminical culture in and around Magadha. In that context, the MBH could be “an attempt to impose, at least imaginatively, a pan-Indian Brahmanism,” writes Hegarty. He adopts Stientencron’s suggestion that the epic might have been composed in Vidisha, the last Sunga stronghold. Its nearness to Sanchi would explain the strong perception of Buddhist threat. Vidisha continued as a locus of political strife even during the Guptas. It could also have been the site for production of the dynastic histories incorporated in the Purana (vide Hans Bakker). MBH’s open-ended narrative structure enables it to interweave commentaries and to focus on existential dilemmas for drawing audience attention and mould their thinking. Realising this helps us to comprehend its use of the past to resolve present confusion—as the Buddhist Dighnikaya does—and to appreciate its locale. The selection of Shaunaka, the Rig Vedic commentator, as the immediate audience shows that the MBH is interested in aggrandizing the Vedic past and applying it to daily knowledge. Frequently it engages Vedic figures like Indra in ideological discussions quite distant from the Vedic. Its three themes are: Brahminical triumphalism; integrating new ideologies and practices; and the existential problems of living. Regarding “place,” Hegarty argues that the Sabhaparva accounts of the halls of gods and men reveals political and social concerns not of mythical antiquity but rather the scattered power-centres of the present. As a counterpoint, Sanjaya in the Bhishma Parva presents a detailed picture of the known world with legitimate rulers as the central authority. Hegarty’s main argument is that the MBH transforms Vedic ritual structures into textual form, setting it deliberately in two sattras (Shaunaka’s and Janamejaya’s) and also in Yama’s sacrifice. These are rites that are repetitive and endlessly extendable. Each rite is embedded within one or many others—just like the Russian doll-like structure of the upakhyanas, complementary tales, of the MBH. The first narrative frame is provided by Sauti repeating Vaishampayana’s recital, which is the frame for subsequent tales-within-tales, of which the major ones are those of Markandeya, Lomasha and Balarama on tirthas and Sanjaya’s narration of the battle-books. Hegarty takes up the Drona Parva as a case-study of this technique of permutation-and-combination, representing it diagrammatically—a telling instance of the application of mathematical models to literature without making it unintelligible. Vidura’s recounting of the trial of Prahlada during the gambling match is analysed to demonstrate how a commentary is woven into the text. Part of the narrative technique is the repetitive interjection of vocatives (“O Brahmin,” “O Raja”) which refer to the audience, not to anyone in the tale, thus indicating the context of the narration. In particular, the repetition of “O best of Bharatas” helps to stress the “overarching dynastic and narrative continuity.” These vocatives act as signals to the audience within and without the text to interpret the material being presented in the context of their own lives. Thus, each narration is a performance too and the speeches within each often pose ironic questions. For instance, Kanva forecasts perpetual imperial hegemony for Bharata’s dynasty, yet his speech is reported in Janamejaya’s sacrifice, long after that dynasty was almost wiped out. Both Janamejaya and Sauti’s audience would be wondering what went wrong. Moreover, the current Kali Yuga began soon after the Pandavas died. So, the same question becomes relevant for all audiences since Shaunaka and his companions. The picture Markandeya paints of Kali Yuga for Yudhishthira is that of post-Mauryan South Asia, current for the audience of the MBH: “much of the Mahabharata is intended to provide a space within which to articulate a new series of understandings of what it means to be human…The war is one way to clear the ground of this.” In contrast, the Ramayana never seeks to address the problematic present, and keeps to its recital of things past. What is of great interest is the manner in which the MBH questions its greatest revelations. Thus, despite the Gita and the many upanishadic exhortations of Vidura, Krishna is cursed and dies an inglorious death, as does Vidura. It is not only the glory of dynastic history that is questioned, but even philosophical solace and the power of the Purushottama himself. The last four books of the MBH relentlessly focus on loss and grief, discounting the salvific messages of the Shanti and Anushasana Parvas. The cultivation of equanimity is urged, but how feasible is it in the context of all the suffering? The final book cites moral failings as the cause of the death of Draupadi and four Pandavas. The final reconciliation comes only after Yudhishthira reaches heaven, and there too with some difficulty. The MBH narration proceeds both horizontally (developing in linear fashion) and vertically (emboxing stories within one another), thus offering the audience a variety of ways of interpreting the material in terms of the varying contexts of the narrations. For instance, while the story of Nala is aimed at consoling Yudhishthira, for Janamejaya and Shaunaka its happily-ever-after ending rings hollow, as they know what happened to the Pandavas. It is because of this ambiguity and irony in its narration that the MBH is very much “a modernist text”, very existential indeed. Tales such as those of the Sadhyas and the swan stress self-restraint, serenity and, above all, the intention behind an act as salvific, which resonates with Buddhist doctrine. Hegarty provides several examples of such Buddhistic parallels from the Dighnikaya which sought to incorporate and supersede Vedic knowledge, as does the MBH. The emphasis on avoiding violence is a message for the ruler from an audience aware of the human cost of the imperial Mauryan impulse. There is emphasis on domestic puja and humble gifts in the post-war book of instructions, turning daily worship into a type of sacrificial rite. These are still practised in all Hindu communities. While innovating, the MBH carefully embeds these in a Vedic context, thus offering a Brahminical synthesis of new ideologies in the late BC and early AD period. Hegarty analyses the Sabhaparva to show that here not only does Maya, instructed by Krishna, construct the hall to reflect the abhipraya, intention, of gods, demons and men, but the parva has a plan of its own. Yudhishthira’s very entrance “is a model of Brahmin-centred conservatism.” Further, there are references to yavana-Greeks and their kings pointing to political contexts relevant to audiences outside the text. Heterodox beliefs are condemned as a vice, and a mini-Arthashastra is presented on norms of governance. The description of divine halls contains the seed of the rajasuya rite, which is the imperial vision of conquest of the four quarters aimed at by this parva. The paradigm of Brahma’s hall being at the centre surrounded by those of the lords of the quarters (lokapalas) is mirrored by Yudhishthira in the Indraprastha hall at the centre of the conquest of the four directions (by his four brothers), whose peoples are enumerated at length, including Rome and Antioch! Interestingly, while rishis are found in all divine and human halls, only one king, Harishchandra, has a place in Brahma’s hall. Atheists and Greeks are absent from the divine halls, which contain only Vedic and post-Vedic figures. The conservative agenda becomes quite clear. However, the destruction the rajasuya brings in its wake seems to wipe out the triumphant galactic picture of the Sabhaparva. We find that at the beginning of the war, in the Bhishmaparva, Sanjaya presents a geography of the earth concentrating on hare-shaped Jambudvipa, mentioning Romans, Greeks, Chinese and Huns, i.e., the world as known at the time of composition of the MBH, not when the Kurukshetra war had occurred. No foreigners exist in the other regions. The four yugas are said to pertain only to Bharatavarsha. Through the lists and descriptions, the war is focussed upon “as the cusp of the problematic present,” which is Janamejaya’s time. The region at the northern extremity ruled solely by Prajapati has only one dharma, contrasted with the many in Bharatavarsha, along with many disputing kings and foreigners. The assurance that listening to this account makes a ruler healthy, wealthy and wise is demolished by the war that follows. “With arms uplifted I shout, but no one listens! From dharma flow profit and pleasure. Hegarty is the first to bring out what makes Kurukshetra such a significant place. It is Prajapati’s main altar; the dwelling of Takshaka, assassin of Janamejaya’s father; where Shantanu’s son Chitrangad was slain; the residence of the asuras Sunda and Upasunda; where Bhishma fought Parashurama; where Skanda was anointed general of the gods; where Sudarshana and Oghavati conquered death. Similarly, of critical importance is the forest of Naimisha, featuring as a major tirtha created by the turning back of the river Sarasvati at the end of a twelve-year rite performed by ascetics. Here Yama held a rite during which the five Indras were cursed; here Yayati’s grandsons sacrificed; and here the MBH is narrated. Tirthas mark great past events, are sites of major rites and where Puranas are composed, many of which are narrated in Naimisha, Kurukshetra and other tirthas. Descendants of MBH characters become interlocutors in these. Both Kurukshetra and Naimisha are linked to the Sarasvati, which is one with Vedic knowledge and ritual. To this, the MBH adds the statement that gods visit tirthas while asuras do not. Visiting tirthas, even listening to their origin tales, earns merit manifold to that from sacrifices. The pilgrimage spots are also located in the four quarters, paralleling the rajasuya conquests. Superior to both tirthas and sacrifices, it is asserted emphatically, is studying the MBH, which contains tales of visiting tirthas. In this manne,r the MBH integrates religious ideas and activities preceding it, and establishes new paradigms in the current socio-cultural and political scenario. For establishing the influence of the MBH on South Asia (actually, South-East Asia) over the first twelve centuries AD, Hegarty selects epigraphs of the Guptas and thereafter. These monarchs compared themselves to the epic heroes and the descriptions of their conquests use terms reflecting the world-conquest goal of the MBH. Land grants refer to Vyasa’s pronouncements and the samhita of one lakh verses. So, in the 5th century AD the size of the MBH was almost what it is today. They emulate the reciprocal relationship between king and Brahmins depicted in Yudhishthira’s gifts to them. Both epics are looked up to as models for kingly conduct. Some, like the Chalukyas, trace their descent to epic figures like Drona and Kartavirya Arjuna. One wishes that sculptural representations from the MBH had also been touched upon to bring out what aspects were considered significant. The epilogue deals with fresh re-construction of the past in the MBH tele-serial—introducing ideas of democracy and nationhood—but loses out by being aware only of the Chopra version, not the different approaches seen in versions by Sanjay Khan (2001) and Siddharth Tewary (2013). Nor is he aware that the script for the Chopra serial was by a Muslim, Rahi Masoom Reza (available in English translation), which lends it a unique dimension, and that in the repeat telecast the government, for political reasons, excised the initial episode in which Bharata disinherits his unfit sons, thus proving the modernity of the MBH. One expected a comparison with Peter Brook’s interpretation. Hegarty surprisingly refers to Vajpayee as “Bihari Vajpayee.” His immersion in Sanskrit ought to have provided an awareness of Indian names. All in all, the book is an extremely stimulating read, laying out a rich repast of new insights into the relevance the MBH had for the time of its composition and continues to have even today as an existential, modernist text. So far there have been only two novels on the patriarch of the Mahabharata (MB): M.M. Thakur’s “Thus Spake Bhishma” (1991) and Kamesh Ramakrishna’s “The Last Kaurava” (2015). McGrath’s is the sole book-length study of how Bhishma comes to be regarded as the supreme moral authority. So much so that Krishna, instead of advising Yudhishthira himself, has Bhishma from his death-bed lecture Yudhishthira on various aspects of dharma over an astonishing period of two months speaking as both prince and priest. McGrath finds that in MB morality is fourfold: a behavioural value-system; variable depending upon conventions; transcendent (the Gita); and personal. The last aspect is also the most vexed because this “pitamaha” (grandfather) is celibate and does not continue his lineage. Ambivalence characterizes him. He is torn between duty to the throne and affection for the Pandavas and their right to the throne. McGrath argues that Bhishma’s understanding of right conduct stems not from tradition and shastras but from an epiphany. McGrath argues that the theophany to which Krishna exposes Bhishma in Dhritarashtra’s court engenders a detachment because of which he can fight against those whom his heart favours and accept death without a murmur. Drona underwent the same experience, but we do not find him evincing such “vairagya”. Both fall undefeated, voluntarily laying down their arms and enter into meditative trance to die. His authority stems from his being the only true descendent of Kuru. True, his eldest paternal uncle Devapi became a sanyasi being denied the throne by Brahmins because of a skin defect. But how do we forget the existence of Shantanu’s brother Bahlika? He had a son named Somadatta who fought in the war. It is not clear how Bhishma getting Pandu married to Madri would restore the patriline as she has nothing to do with Bahlika. McGrath does not resolve how Bhishma reconciles keeping Karna out of the war for ten days with loyalty to the throne. The parallel with Achilles sulking in his tents is pronounced. This is paralleled by Karna, despite his much-vaunted loyalty to Duryodhana, not capturing Yudhishthira after trouncing him, Bhima, Nakula and Sahadeva. Further, both Bhishma and Karna are displaced eldest sons, a leit motif in the epic. The two greatest philosophers, Krishna and Bhishma, are both eighth sons with their elder siblings murdered. McGrath does not clarify how Duryodhana displays magus or shaman-like characteristics. Neither is it correct that the Dhartarashtras have no cult status. Temples to Duryodhana (and Karna), Shakuni and Gandhari exist in Garhwal, Kerala and Bangalore. Nor is it that Bhishma is not worshipped anywhere. Allahabad has a temple in Daraganj built in 1961 with an image of Bhishma on the bed of arrows. Special puja is conducted during the “pitri-paksha”. Narkatari Temple with a pond called “Bhishma Kund” is at Kurukshetra commemorating where Bhishma lay. It is not purely a Kshatriya view of the universe that is depicted. Bhishma’s discourses include a considerable portion portraying varying Brahmin views as well. Further, Sanjaya does not merely see and recount; he actually participates in the war, being almost killed by Satyaki. Sanjaya is the world’s first war-correspondent. The reference to Vyasa as “chiranjiva” (p.5), ever-living, is puzzling as he is not described thus, unless it is taken as a reference to this appellative being given to the series of such editors/compilers of whom Krishna Dvaipayana belongs to the Dvapara epoch. Again, with the detailed description of the wondrous hall constructed by Maya, how can we say that MB depicts “an idealized culture where there is…no substantive architecture”? McGrath’s point is well taken that precise portrayal of rituals is missing, as though these had become unfamiliar. Similarly, physical details of characters are few. They are mainly moral figures. Vyasa’s conjuring up of the shades of the dead who rise with “a great sound” from the Ganga is taken as a metaphor for the making of the “maha-kavya”. We, like Dhritarashtra, visualise in the mind’s eye what Vyasa (and Sanjaya) narrate. McGrath is the first scholar to point out Kunti’s culpability in causing the partition that culminated in the war by concealing Karna’s identity. On a different level, Surya bears equal blame in not supporting his son effectively whereas Indra comes to the aid of Arjuna powerfully. Kunti’s causation of the “bheda” is structural, while Draupadi’s is temporal, constantly goading her husbands towards the holocaust. Their influence is far more pervasive than those of Kryseis and Briseis in the Iliad to whom McGrath compares them. It is not only that we have no idea of which text of the MB Nilakantha (late 17th c.) was commenting upon, as McGrath says. In 1584-86 when it was translated into Persian as Razmnama, there is no indication of what text was used. The names of the scholars Akbar appointed indicate that they were drawn from all corners of India, showing awareness of the existence of different versions. However, we do know from the illustrations Akbar commissioned that for the Ashvamedha Parva the Emperor chose Jaimini’s composition instead of his guru Vyasa’s. McGrath maps six crises in Bhishma’s story which bring about his fall: the abduction of Amba and its results; his advice to partition the kingdom; his offering the supreme honour to Krishna in the rajasuya yagya; his aloof stance in the molestation of Draupadi; his silence about Karna’s birth and his acceptance of marshal-ship in Kurukshetra. Thus heroic Bhishma is at the very core of the collapse of order in the narrative. There is a seventh decision that plays a critical role in the plot: his appointing Drona as royal tutor knowing his obsessive animosity against Drupada. In the Harivansha (I.20) Bhishma recounts how the usurper of Panchala, Ugrayudha, demanded that the widow Gandhakali (Satyavati) be handed over to him. Bhishma killed him in a mighty war and restored the kingdom to Prishata, Drupada’s father. Vyasa never clarifies why Drupada holds a yagya seeking a son to kill Bhishma. Bhishma’s regency is described in ideal terms, making him the authority for declaiming on governance. People clamoured for him to become their raja, he tells Durodhana (V.145.25). His description of Yudhishthira’s rule in the Virata Parva (IV.27) echoes this idealistic picture. However, later the people criticise him for not protecting the Pandavas against Duryodhana’s machinations and say that he “does not attend to dharma” (I.137.5). When the Pandavas depart on exile they revile him again, along with Vidura, Drona and Kripa (here McGrath mistakes “Gautama” as referring to Drona who is a Bharadvaja, whereas Kripa is a Gautama). The vow he takes gives Devavrata the appellative “Bhishma”, “terrific” and that is what characterises his speech. The only person to vilify him, and at length, is Shishupala. Bhishma’s response is to offer up himself as an animal sacrifice. Instead, it is Shishupala who is beheaded. Bhishma repeats this in the Bhishma Parva, and his offer is accepted. Although McGrath says that the killing in the rajasuya is not commented upon, Vyasa categorically prophesies calamities as a consequence on being asked by Yudhishthira. It is, however, difficult to agree with McGrath’s repeated assertion regarding Bhishma’s “transcendental awareness” of dharma as truth attained through dhyana-yoga as it is not manifested in his conduct. The unique lucidity of behaviour that McGrath praises is nowhere in evidence in the dice game episode where he is the epitome of confusion. Even the code of battle he lays down is not observed during his marshal-ship. However, it is true that Bhishma stands as the moral standard in the poem as far as his discourses are concerned, which are in a didactic poetic tradition totally different from what has gone before. It is another matter that Duryodhana gives him short shrift, yet cannot escape making him the marshal. By stating that Bhishma and Vyasa are descendants of the rishis Vishvamitra and Vasishtha, who were contemporaries, McGrath creates a chronological problem. Vyasa is Vasishtha’s great grandson, but Bhishma is many generations after Vishvamitra and is descended from his daughter Shakuntala, who is half-human as is Bhishma himself having Ganga for his mother. It is interesting that the three preceptors of the Dhartarashtras—Bhishma, Drona and Kripa—are born of apsaras. On the other hand, their opponents, the Pandavas, have devas for fathers, with Bhishma being the Vasu Dyaus (sky) reborn. Like Krishna, the other avatar, he is the eighth born with his elder siblings having been killed. Bhishma remains caught in the middle, a predicament that Krishna easily side-steps. Unlike Vidura, Bhishma never asks Dhritarashtra to reject Duryodhana. Karna, born of Surya, queers the pitch of the Dhartarashtra-Pandava balance. As with Karna, Bhishma’s sense of personal honour supersedes loyalty to Duryodhana. Neither will kill the Pandavas (Karna makes Arjuna the exception, as Bhishma does Shikhandi) though it may cost Duryodhana victory. The phrase, “egotistical sublime” can well describe both. Beginning with driving Satyavati to Hastinapura to wed his father, Bhishma becomes the bride-supplier to its princes. Kunti is the only exception. The repeated rite of abduction whereby Bhishma, Arjuna and Karna (for Duryodhana) obtain brides raises the question why this form of marriage named “rakshasa” was approved for Kshatriyas. Why was the royalty adopting a custom of people they condemned? McGrath makes the very striking point that the MB is about adharma as it deals with the onset of the “impoverished” Kali Yuga when dharma stands on just one foot. Thus, only a fourth of all action and speech is dharmic! All characters are, therefore, compromised, Bhishma most of all. He chooses to act on loyalty instead of upholding moral judgement. “Kinship is the absolute, not ethics.” That is why this is such an existential poem and in that inheres its tragic appeal to us. It is interesting to find McGrath asserting that the battle in the Virata Parva is drawn from a different poetic tradition, very archaic in style, because many Western scholars opine that this is a burlesque added on later. Sri Aurobindo held that this parva shows the young Vyasa at work. Bhishma is the warrior of unrivalled excellence and he describes his ability at length to Duryodhana.. When McGrath argues that Bhishma is never defeated, he forgets the Virata Parva encounter where he and everyone else is laid low by Arjuna. 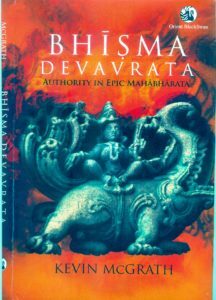 Bhishma Where Drona is called “the more experienced warrior” has not been cited. Nor does Bhishma call Karna “a half charioteer” (p. 71). The word he uses is “ardha-ratha,” i.e. “half-chariot-warrior”. Bhishma’s supremacy as warrior is established by his victory over his guru Parashurama, the decimator of Kshatriyas. There is a contradiction here because Parashurama would not tutor anyone but a Brahmin, as Karna finds out to his cost. Further, in the beginning in the list of contents (I.2.79) Bhishma is described as guarding Chitrangad. No evidence of this is forthcoming as this young prince dies in a duel with no sign of his protector being around. Indeed, Bhishma’s regency is characterised by status quo, with no awareness of Jarasandha’s imperial designs reaching out from Magadha to adjoining Mathura and surrounding areas, imprisoning numerous kings. McGrath alone has pointed out that Bhishma’s reluctance to fight his guru prefigures Arjuna’s predicament. Both events occur at Kurukshetra which is also the scene of the philosophical discourses of both Bhishma and Krishna. McGrath states that whereas Arjuna overcomes his qualms about violence, Bhishma does not (fn. 33). If that were so, Bhishma would not have gone on slaughtering ten thousand troops daily for ten days. It is not only Bhishma’s charioteer who goes unmentioned, as McGrath remarks, but Drona’s too, which is very peculiar as the charioteer’s role is seen as crucial. It is as though Bhishma were totally alone in war, as solitary as in his celibacy, not needing another presence. He never loses control even when Krishna loses his composure and rushes at him twice over. Apart from Vidura who is no warrior, he is possibly the only character truly detached from his own self, so much so that he reveals how he can be brought down. Karna, too, gives up his impenetrable skin-armour, and in doing so values adherence to his word over loyalty to Duryodhana, just like Bhishma. Both are altruistic, but Bhishma does not behave thus for sake of glory. That is the nature of his renunciation, “vairagya”. He never voices his emotional anguish and only announces that he is tired of his body and invites Yudhishthira to kill him. The special death that he, Drona and Vidura undergo, suggests McGrath, is a result of the theophany experienced during Krishna’s embassy to the Hastinapura court. McGrath trips up here in writing that Vidura dies in the Mausala parva, whereas it is in the Ashramavasika Parva. McGrath feels that Bhishma “is the truest practitioner of Krishna’s Gita teaching…able to practise vairagya” in action, unconcerned about the fruits of his acts. Arjuna forgets the teaching and asks for a repeat performance in the Ashvamedha Parva. Bhishma alone sings paeans to Krishna, not Arjuna. His is a profound moral understanding of the cosmos, symbolised by the hamsa (swooses) who appear when he falls. No wonder that he should be the one to discourse on the paths to attaining moksha at great length. The adharma-centred eleven books are more than balanced by the two massive tomes on dharma. McGrath asserts that Bhishma’s discourses on governance form the template of the Gupta imperial rule, being quite different from the type of kingship modelled by Yudhishthira, which is power shared with brothers and Krishna, and characterised by seeking revenge for justice. What Bhishma depicts at very great length is a codified system of judgement that we find in the dharmashastras and Kautilya. It is common in late Bronze Age cultures (Hittite, Assyrian, Judaic), none of which are anywhere as encyclopaedic. In doing so he also reveals a massive store of oral tradition replete with moral tales of incredible variety and speaks in multifarious voices (McGrath counts as many as 280) but without emotion, despite the anguish he has suffered far longer than anyone else. That lifelong suffering, despite which he has not deviated from his principles, also sets him on a moral pedestal because of which his authority extends well beyond the poem into all audiences. McGrath is quite correct in positing that the Anushasana Parva was originally part of the Shanti Parva which thus consisted of four dharma-texts: raja, apad, moksha, anushasana. Indeed, the list of contents does not mention the Anushasana separately. Further, the oldest list of parvas found in the Spitzer manuscript (1st-2nd century CE) in a cave in Xinjiang province of northwest China does not mention it. Vyasa informs Yudhishthira that Bhishma learnt all this from Brihaspati, Ushana, Chyavana, Vasishtha, Sanatkumara, Markandeya and Indra. The discourses are in a style completely different from the preceding heroic mode. Where Dharma’s avatar Vidura is only a speaker, except where he rescues the Pandavas, and where the son of Dharma Yudhishthira violates dharma at critical moments, Bhishma speaks most powerfully and also acts righteously. However, McGrath bypasses the issue that at crucial junctures he does violate morality by omitting to act, e.g. in failing to protect the young Pandavas from Duryodhana’s villainy and Draupadi from being publicly molested. We should add to this his deliberate obfuscation of the truth about Karna’s birth, which is surely not moral by any standard. It is curious that McGrath should be unclear about the effect of Shiva in the narrative. His presence is quite pervasive. He sends the five Indras down to earth with Shri as their common wife; his boons to Amba and Drupada produce Shikhandi as Bhishma’s killer; he provides Arjuna with divine weapons; he precedes Arjuna’s arrows killing those he aims at; he empowers Ashvatthama to massacre the Panchalas and Draupadeyas; by his boon Krishna obtains Samba the source of his clan’s annihilation. Bhishma himself in his three paeans to Krishna refers to him as Rudra and Shiva, while Krishna sings Rudra’s praises in the Drona, Shanti and Anushasana Parvas as McGrath notes. Thus, Bhishma’s devotion to Krishna includes Shiva. We do not find any other hero displaying such devotion which is independent of ritual and this elevates him to a unique level of spirituality. In the context of Shiva we should not overlook the symbolism conveyed by the names of the Kashi princesses: Amba, Ambika and Ambalika. All are names of the Supreme Devi. Vyasa rapes two of them. The consequence is defective progeny. In the affront to Amba, which leads to her invoking Shiva, and the omission to act to protect Draupadi, Bhishma is arousing the rage of Shakti. We find Kali appearing amidst the carnage of Kurukshetra. Since both Bhishma and Vyasa represent patriarchy (both are “pitamahas”), the extinction of both their lineages (Vyasa even loses his son Shuka) suggests that the final establishment of Yadava hegemony represents the victory of the matriline. Following Russell Blackford, McGrath sees Bhishma’s authority in three dimensions: “objective moral” (the Pandavas’ right to rule); “inescapable practical” (loyalty as an employee of Duryodhana) and “transcendent” (gladly falling to Arjuna’s arrows). He infuses the epic with the overtone of normative action and expresses it in speech that influences the audience so powerfully even today. The beauty of the MB is that everyone believes he has a right to act as he does. It is the wide variation in these views that, McGrath holds, produces the clash between adharma and adharma, not dharma and adharma. But would that not mean that Bhishma’s “objective moral authority” favouring the Pandavas is adharma? McGrath’s footnote admiring Narendra Modi has taken a vow of celibacy like Bhishma is intriguing. McGrath feels that as with Gandhi and Aung San Suu Kyi (married and separated), this feature lends great moral authority. In Bhishma’s case it is refraining from “biological union with all of life” that accounts for his moral authority even today. It is important that no judgement is passed on Bhishma’s decisions (Gandhi-like “experiments with dharma?”). This is left to the audience. In an interesting section, modern perceptions of Bhishma are surveyed as in Tharoor’s The Great Indian Novel, Peter Brooks’ play and the several TV versions of the MB. Brooks’ five-finger exercise provides the least insights about Bhishma. McGrath concludes that moral authority vests not in any character but in the MB itself which “remains a charter myth” for modern India. McGrath shows that dhyana-yoga is the means whereby Vyasa composed the MB, veritably creating an entire world and portraying its destruction, just like kala-Time itself. By paralleling the action of cosmic time, the epic becomes the authority on dharmic awareness for its audience. It achieves this through speech which conveys thought and is then translated into action. It is Bhishma who is the most prolific speaker in the MB, charging it with power “that it intrinsically transcendental and suprahistorical”. That is why it remains the greatest commentary on adharma for the world. Smeared on his body. (I.136.19-20, the P. Lal transcreation). The concluding section is a fascinating analysis of how the redactors arranged the poem to secure moral influence. Beginning with the voice of an anonymous poet (who speaks again after an interval), we find Ugrashrava reciting, Dhritarashtra lamenting, succeeded by Sanjaya describing, then revert to Ugrashrava. About the first two-thirds of the first book McGrath writes, “The evidence is of a rough and syncretic compilation…not a labour of inspiration but of …literary anthologists with a particular socio-politico agenda in mind” moving back and forth in time.” The Adi, Vana, Shanti and Anushasana Parvas cobble together numerous narratives like a patchwork quilt (the Bengali “kantha”) or bricolage. The others are inspired composition. It is questionable, however, that Ugrashrava is performing long after Janamejaya’s death since he states that he is just coming from that king’s snake-sacrifice. Nor does Vaishampayana state that the epic’s performance needed three years. Rather, that rising daily, Vyasa completed composing it in three years. Vyasa did not recite it to Janamejaya as McGrath states (p. 158) but asked Vaishampayana to do so in his presence. P.L.Vaidya, whom McGrath quotes, is mistaken in asserting that the recitations by Vyasa’s pupils retained the same contents with different wording. We have evidence of the vast difference in content that exists in Jaimini’s version of the MB, of which the Ashvamedha and Ashramavasika Parvas are extant. In the considerable number of passages the Shanti Parva shares with the Manusmriti the Bhargava hand is clear, Bhrigu expounding the latter. His name occurs 135 times in Bhishma’s discourses. He is a paramount exponent of moral order whom Bhishma imitates. Indeed, the MB begins with tales of Bhrigu’s lineage, creating a world of mythical wonder. Through Bhishma’s defeat of the Bhargava superhero Parashurama were the editors projecting him as their icon representing the ideal of dharma expounded in the Shanti and Anushasana Parvas? Further, it is significant that the Gita is embedded in the Bhishma Parva. McGrath likens their work to that of Lonnrot with the Finnish Kalevala, of Virgil with the Aeneid and of Wagner with The Ring cycle. McGrath is the only scholar after Andre Couture to bring to bear insights from the Harivansha on the MB. He points out Vyasa’s use of the word lekha, “signs” or “writing” (114.27) indicating that much after the epic’s composition its written form became authoritative instead of oral performance. That is why the merit accruing from listening to the MB includes gifting a copy of it. In establishing Bhishma as the supreme moral figure, however, McGrath “doth protest too much” as in the repetitive assertions in the latter half of the book. One cannot also agree that Bhishma is “an icon of justice” because though he spoke of it profusely in action he did not exemplify it. A shorter version of this review was published in The Sunday Statesman of 3rd June 2018 in the 8th Day Literary Supplement.